John Battelle's Search Blog Thinking Out Loud About Voice Search: What’s the Business Model? Thinking Out Loud About Voice Search: What’s the Business Model? (image) I don’t have Siri yet – I’m still using my “old” iPhone 4. But I do have my hands on a new (unboxed) Nexus, which has Google Voice Actions on it, and I’m sure at some point I’ll get a iPhone 4GS. So this post isn’t written from experience as much as it’s pure speculation, or as I like to call it, Thinking Out Loud. But driving into work yesterday I realized how useful voice search is going to be to me, once I’ve got it installed. Stuck in traffic, I tried searching for alternate routes, and it struck me how much easier it’d be to just say “give me alternate routes.” That got me thinking about all manner of things – many of which are now possible – “Text my wife I’ll be late,” “Email my assistant and ask her to print the files for my 11 am meeting,” “Find me a good liquor store within a mile of here,” (I’ve actually done that one using Siri on my way to a friend’s house last weekend). I’ve written about this before, of course (see Texting Is Stupid, for one example from over three years ago), and I predicted in 2011 that voice was going to be a game changer. It clearly is, but now my question is this: What’s the business model? I hate to pick on Google, but it’s worth asking the question, given how it dominates mobile search: What happens to the AdWords business model when a large percentage of mobile searches are done using voice? Given we don’t look at our screens while using voice commands (pretty much the whole point, no? 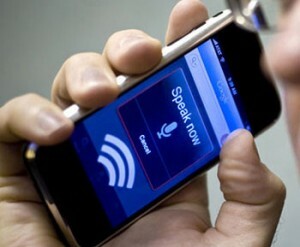 ), how will Google make money from voice search? Now, Google does have one model in market that could translate to money in voice search – what it calls “Click to Call.” This is the ability for businesses to integrate direct phone calling into their mobile ads. I don’t know if that model is integreated into Voice Actions, but I’d be surprised if it didn’t show up soon (I can imagine Google’s version of Siri asking “Would you like to call this business now?”). And while that should prove a decent revenue stream, it won’t cover the majority of voice searches. And Google isn’t a company that likes to give away search without a monetization strategy. What do you think such a strategy might be? Could we even imagine the return of “paid inclusion” – where voice search results are returned based on who pays to be part of the results? Sounds far fetched, but at the right scale, it could work. I’ve not done much thinking about this, but I bet some of you have. What do you say? Apple Siri of course has changed a lot. But I think Google has offered tons of services to get enough data to make the technology perfect. I remember they had a free voice calling service that was a good alternative to yellow pages. And the end result of all these voice based services enabled them to offer Voice Commands on Android (and other platforms). Also plays a part in the Google Voice service in USA which could some day be charged for. Voice has plenty of uses. Google probably has a long term goal with this technology though Siri has changed the scenario a lot for them. From being one of the best in the market, they are now considered crude. Nuance (which powers Siri) has done an incredible job with their technology! Yes, I did think that perhaps the data is more valuable long term in any case…. Siri may be Steve Jobs revenge, for Google copying the iPhone. Or as Jobs complained, ‘We didn’t enter Search’. Siri could really hurt Google, especially when it is launched across other Apple Products such as the iPad, iMac and iTV. Why type on Google Search, when you can just sit back and tell Siri to do the work for you. At this moment in time, I don’t think Apple are too concerned about making money from Siri Search. They just want to develop the best User Experience, in the same way that Google did in their earlier days. But eventually, Apple could make money through ‘Siri Links’. ‘Siri Links’ would be the driver for helping Users reach a Business Destination’s Web Services much more effectively than Google’s current Ad Words model. Of course Google could copy this with their own Voice Link Services. But in the long term it could have negative effect on their Ad Words revenues, especially if ‘Bing Voice Links’ gets in on the game as well. As I said on Twitter, I should have titled the post “Apple’s Secret Plan to Kill Google Search” That woulda driven traffic, boy. I am so lame. My anecdotal data suggests that primary voice usage is still in the car. I’m not yet sure if Siri has transcended voice usage from the car to the broader day? The primary issue is not Siri (NLP), it’s the accuracy of voice to text (eg Nuance) in a “noisier” environment and/or the use of voice in public places where the query itself might be private especially when the data requested (search/intent) is against personal data (eg email from John). That being said, I’ve heard that Siri has displaced Google Local Search on the iPhone 40:1 – I’m skeptical that the ratio would be that significant but certainly some % of high-value local search is now occurring via voice w/ Siri-delivered Yelp results rather than w/ Google. In my past experience working in the mobile browser space, search was mostly comprised of local followed by adult and then a long-tail which was not very monetizable (and the type of queries that Siri probably cannot answer yielding Google search results anyways). Given that, the only search we really care about is Local. It’s less likely you would click on an ad if one was even available against a fact lookup search (eg height of a building). It’s conceivable, they can play w/ the rank order of results (eg like a banner/search ad) but at this stage I’d imagine, their primary goal is to defeat the mktg muscle of Siri – it is the ultimate in-store demo! It will be interesting to see Majel (Google’s response) and how they position it. Thanks for the thoughtful comment. It will be very interesting indeed to watch Majel. …we just took voice search, gave it a pretty name and made you think it was better. A future scenario could be a return to paid products/services without ads. Most likely on subscription plans. Google, more than any other company, created the ‘free’ industry. Maybe, the pendulum will swing back with Apple doing most of the pushing in the other direction. I wonder if this isn’t just an example of a more general question of what the “post advertising” business model looks like. That is, if our goal is to accomplish a task and computers get very good at translating our intent into an action, then there’s no room for traditional advertising. There is room for things like CPA, transaction fees, subscriptions and the like. Also, I reckon the equivalent of paid placement exists (where all else is equal, the provider can purchase a higher probability of becoming the target of the action). To me, the most exciting thing is that Siri forces the user to semantically express their intent, knows how to automate the associated workflow and can converse with the user to provide the necessary data. Yes, voice is one way of interacting, but even Siri relies on visuals for anything except the most trivial of requests. Yes, CPA is the ticket imagined with the original version of Siri. If you also buy into the assistant thing then there are many other powerful models that emerge as it becomes a more trusted part of your life. If it really takes off you can make the case that traditional advertising is ripe for major disruption as ads go from reactive to proactive. Will be interesting to watch unfold. Google can monetize a free voice search by targeting ads in other environments. As long as voice search doesn’t supplant web browsing on pages with ad words and browser-based email reading, it’s still contributing (perhaps significantly, based on the fact that I find them still hitting me with car rental ads weeks after I’ve booked a trip). Siri is the feature what makes iPhone 4S different from other generations. It becomes very easy when you stuck up in the traffic and ask your iPhone for the other route. Next Next post: Is Our Republic Lost?